Well, this is the first year that I've done a lot of canning. And I've been experimenting with different methods for preparation to find out which is the most time efficient while still giving a good quality end product. Cleaning: including washing and paring out the stems and bad spots. Whether you decide to steam can or pressure can, you should follow the instructions for your particular canner, and even read through the sections on canning Tomatoes in Putting Food By. There are websites with instructions from places like the North Dakota State University Extension Service. The main issue for tomatoes is that if you use a non-pressure method that the tomatoes have a pH of 4.6 or lower to prevent spoilage and botulism. All of the sites say to use only good, un-bruised, un-damaged tomatoes. Well, we cut out the bad spots. And I risked it because of the next step. Blanching and peeling looked like it would be a pain to do with so many tomatoes. So I didn't do it. I wasn't canning whole tomatoes or chopped tomatoes. I was making sauce. That means I was boiling the snot out of these tomatoes once, and bringing them to a boil a second time just before canning. I tried three ways: Stock Pot; Crock Pot; and large Roasting Pan. Stock Pot: my stock pot is 2 gal, which reduces to just about 1 gal when all done. There is a need to watch the stockpot more closely to prevent scorching the thicker the reduction gets. Crock Pot: Fine for cooking, but it didn't reduce the tomatoes as much or as quickly as I wanted. Oven Roasting pan: Absolutely great for volume and ease. The oven was set to 320F and this did give us a tiny bit of caramelization. We got some overflow and filled the house with tomato/molasses aroma-which was nice to smell, but requires oven cleaning. Lesson: don't overfill the roaster. 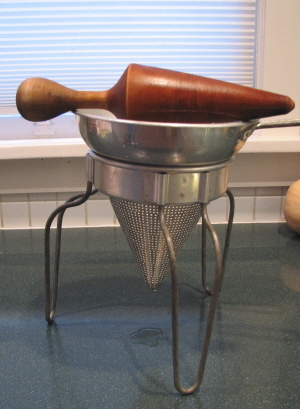 Two methods used were an Italian tomato press and a Chinois (conical sieve). The tomatoes need to cool off to handling temperature before you press them. 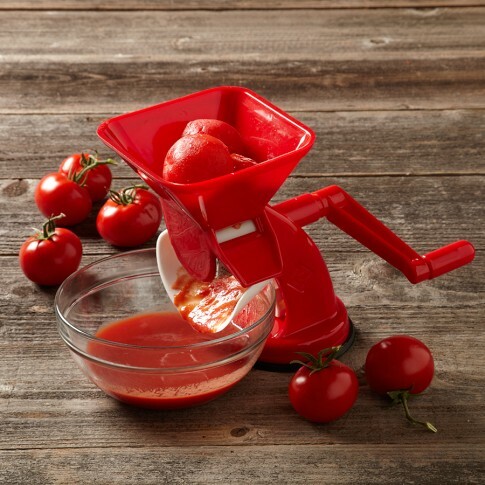 The Italian Tomato Press worked fairly well on smaller volumes. It's intended for fresh tomatoes so the cooked tomatoes wouldn't be too hard for it. However, I had to cycle the remnants through at least three times to extract all the thick pulp. It did a great job keeping the seeds and skins out of the sauce. But it was a lot of cranking. It is great for a small batch, but we were dealing with 30lbs or more per batch. Unfortunately the press has the expeller and the juice flow so close together it's hard to find pans that would handle the output without the crank getting in the way. Since the base is secured by suction, the table in this photo wouldn't work. And after washing the press a little olive oil on the suction cup keeps the rubber ready to adhere to a clean flat surface. The Chinois worked great for the large batches. Grandma had one of these. We borrowed ours from our neighbor, Muriel. Now I need to scour the 2nd hand stores for a good quality old model. Very fast work of 30 lbs of tomatoes. Heated on the stove slowly, and I mean really slowly, scorched tomato sauce/paste just doesn't taste all that good. I put the hot sauce into hot jars just sterilized for 20 minutes in the steam canner (these had been sterilized before with 20 min of boiling water) and set the seals to warm up in boiling water. So here's the 30'lbs of tomatoes in 6 quart jars, no peels/skins, no seeds. Ready for steam canning. The jars and sauce are already in the 170F or higher. The canner is ready. I brought it to full steam and let them sit in the steam canner for 40 min. You need to leave an inch of head-space in the jars, or they will overflow as the contents boil. The pulp can cause the seal to fail. That's why head-space is important.